The opening scene of the film, Bedtime Story 1964, shows the Château de La Napoule as the home of the lead character played by David Niven. 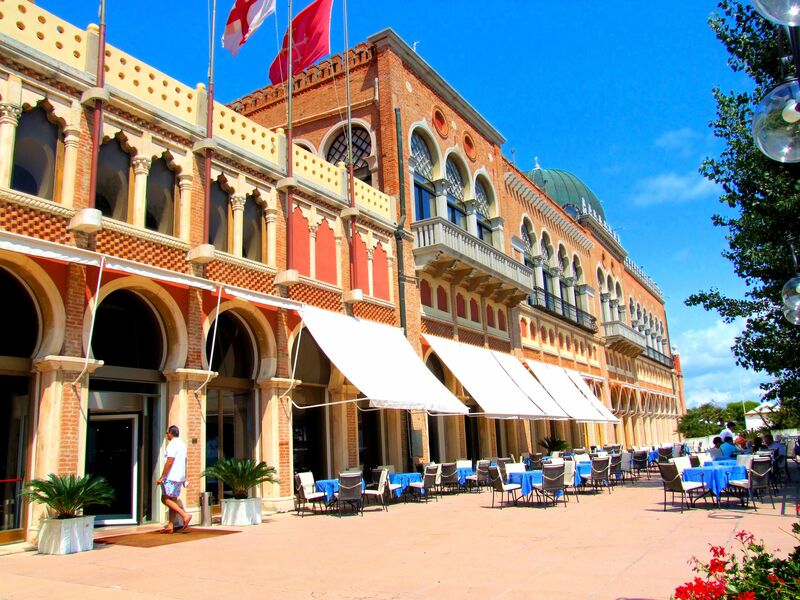 The Château is described in the film as being in Beaulieu-sur-Mer, 45 kilometres away, which is depicted in the film as Beaumont-sur-Mer. The actress, Jeanne Moreau, attended the 11th Cannes Film Festival which was held from 2nd May to 18th May 1958. She found time to travel the six miles (9.6 kilometres) to La Napoule for a photoshoot with the famous chateau in the background. Two years later, at the 13th Cannes Film Festival, which was held from the 4th to 20th May 1960, she shared the Best Actress Award with Melina Mercouri. Jeanne Moreau’s film was Seven Days… Seven Nights (Moderato Cantabile) and Melina Mercouri’s film was Never On Sunday (Pote Tin Kyriaki). Jeanne Moreau on the beach by Château de La Napoule 1958. An amazing drone flight over the Château and its gardens. It was just after 4 a.m. yesterday morning when I woke with a parched throat, I’d been sleeping with my mouth open. I had a slight headache as well. I didn’t want to get up but knew I’d benefit from a glass of water. I made my way to the kitchen leaving my girlfriend, Madly, asleep. Her parents, aficionados of mid-20th century popular music and, of course, film noire, had named her after Jacques Brel’s remarkable wife, Madly Bamy, and she really is. I didn’t need to switch on any lights because the flat wasn’t in pitch darkness with outside lamplight and moonlight seeping through the blinds and drapes. As I stood before the kitchen sink slowly sipping cold tap water to alleviate my throat, I leaned forward to glance, through the Venetian blinds, across the green front lawn area and road towards the old terraced houses opposite. I could see a number of armed police officers, dressed in combat gear, hooded, gas-masked and wearing bullet proof clothing, crouched either side of the front door of the house immediately opposite. Without disturbing the blind, I looked up and down the road either side of me. In both directions I could see parked black vans. The ’phone clicked and the line was dead. I picked up a camera and a mini tripod and returned to the kitchen. I set up the camera with the lens pointing through the blind and started filming. 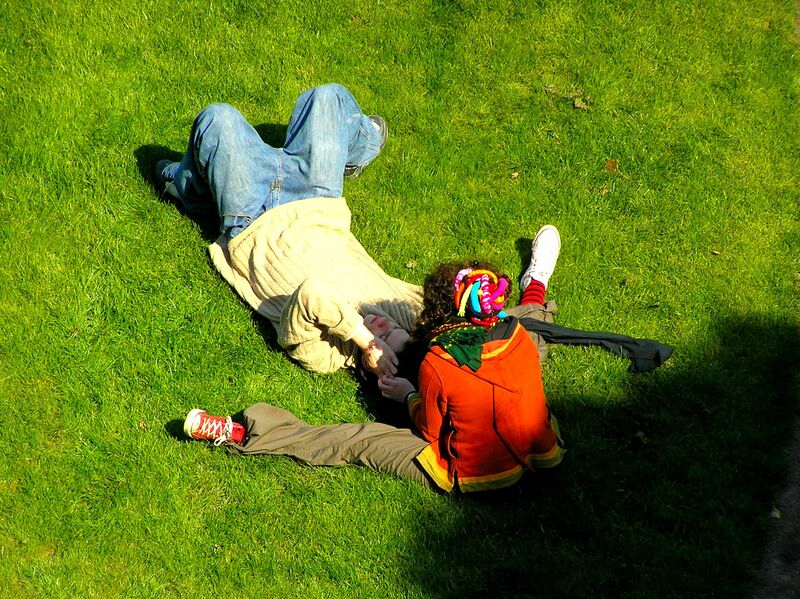 She came over and stood beside me, took my hand in hers and gazed discreetly through the blinds. Then she saw the camera. We watched as the front door opposite was smashed in and a stream of officers entered the house. Within moments we heard muted explosions, we guessed from stun bombs and gas canisters. Then the property exploded in one huge flash, blowing out all of the windows. Madly was frozen in shocked silence then, moments later, all of the officers emerged from the smoked filled doorway, dazed but unharmed. “Neighbours are coming out,” said Madly and we could both see people emerging and coming into view from both sides of the street. “Let’s get out there with them and act as shocked and confused as they are,” I said. “It’s like the beginning of some optimistic writer’s spy novel,” said Madly. “Because it is,” I replied. “And I suppose I’m just a figment of your imagination?” she smiled. “Some hope,” she replied and kicked me hard. My submissions to the Guardian Witness website on the theme of voyage. The Guardian uploaded my two videos to YouTube at a lower resolution than the originals but they’re fine if you don’t go fullscreen. When three voyages intercept … which one wins? The thrilling race to the dock! The building was originally built in the late 19th century as a power station to supply electricity to the Royal Mail post office. It was largely rebuilt to an Art Deco design by architect Albert Moore in 1928 and 1929. 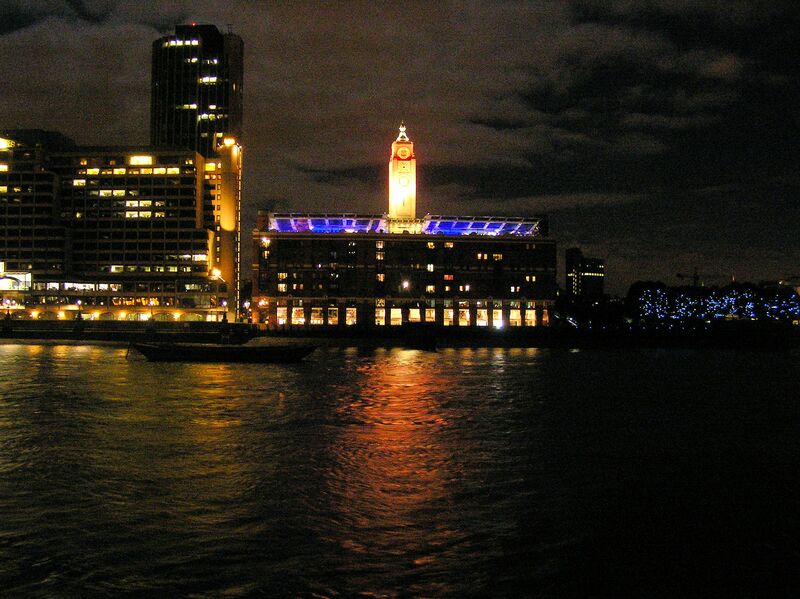 Although most of the original power station was demolished, the river facing façade was preserved. For a long period of time preceding the late 1970’s and early 1980’s the building was derelict. Eventually the tower was refurbished, in the 1990’s, to a design by Lifschutz Davidson which included housing and commercial premises. It is now run by Redwood Housing Co-op which leases seventy eight flats at Oxo Tower Wharf comprising of twenty eight one bedroom flats, forty five two bedroom flats and five three bedroom flats. I inadvertently omitted the words in red when I submitted the photo to Guardian Witness. You want a cab ride or a taxi voyage? 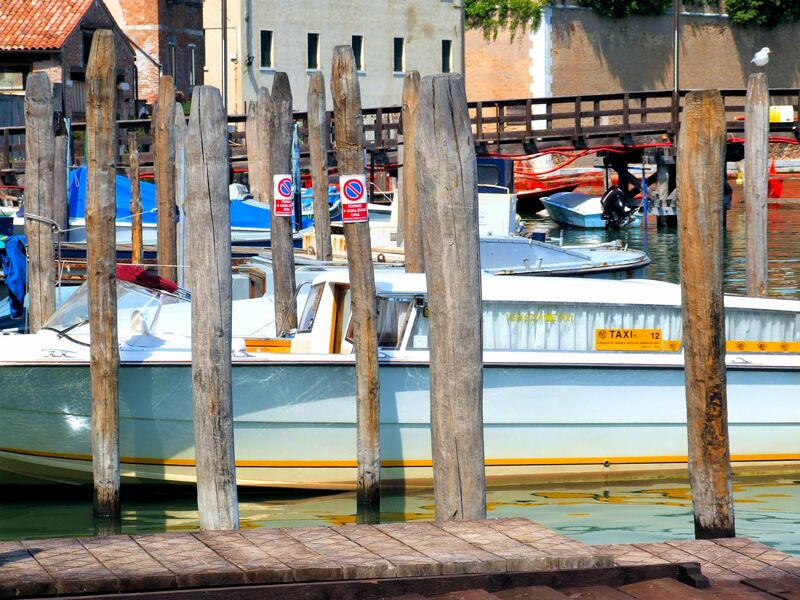 Venice where taxis are fun. Most of us have probably signed up to a website and then been unable to access it because we’ve forgotten the password. I signed up to the Guardian Witness website on 18th October 2006. Back then, those of us who signed up were given an ID number. Mine is ID114202. Anyone signing up now can use a name but The Guardian hasn’t provided any means by which those of us who were assigned a number can update our membership to show a name instead. Back in 2009, for some forgotten reason, I tried to access my Guardian account but I couldn’t remember my password and there was no system in place to recover it. I tried to sign up again and was met with an automated response to the effect that the email address I was providing belonged to another account. Consequently I opened a new account, on 9th September 2009, using a different email address, and was assigned the ID number, ID3777763. Before I started uploading photos, I’d never bothered to sign in because I didn’t need to just to read articles. I came across the photography assignments page in about November/ December 2014 and needed to log in so that I could submit my photos. Without thinking, I logged in with my old account information, including my once forgotten password. I recorded my ‘forgotten’ password and made my photography submissions ensuring that I stayed logged in. About four months ago, I was having a few problems with my browser so I used a different one. I opened The Guardian Witness website and made my submissions which appeared on The Guardian Witness website. I didn’t notice that the different browser was logged in to my later ID. The photos below appear on my alternative 2009 Guardian Witness website. It’s a one-off because I’ve gone back to the 2006 website because I have eleven pages of photos there. Walking along Quai Georges Pompidou, 34280 La Grande-Motte, Languedoc-Roussillon, France, I took this photo at 320 Quai Georges Pompidou. 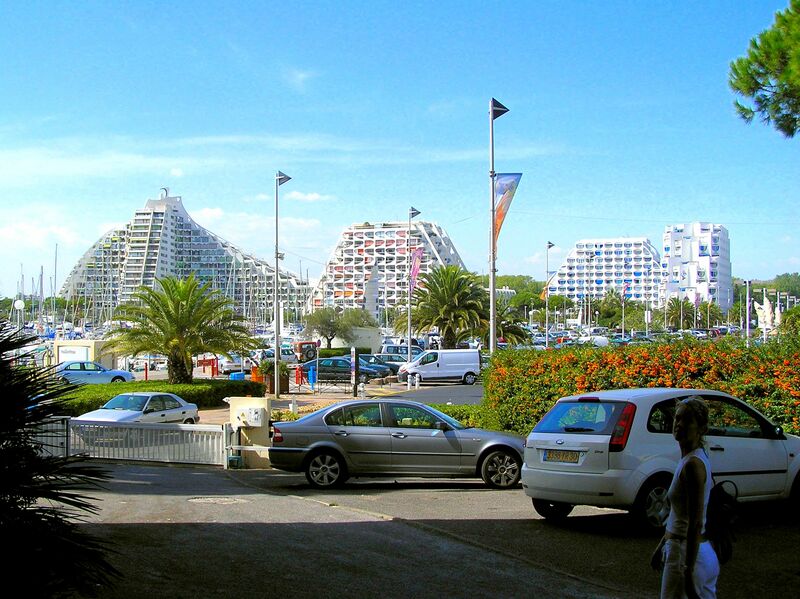 La Grande Motte is a resort town built mainly between 1960 and 1975 on undeveloped beachfront land. 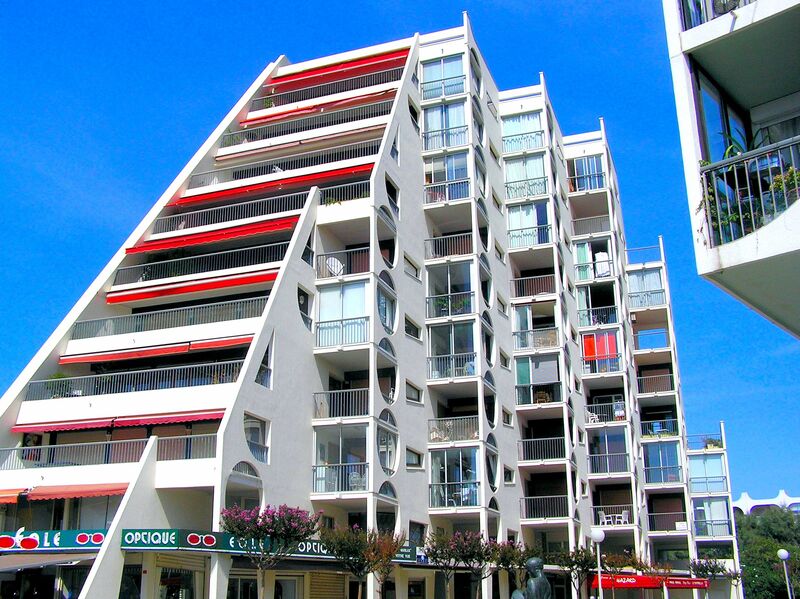 Jean Balladur, the project architect, was inspired by modernist architecture in Brazil, especially the work of architect Oscar Niemeyer and by pre-Columbian pyramids like those of Teotihuacan, Mexico. Pierre Pillet, the landscaper, was involved in selecting plants that would thrive in the marine climate. 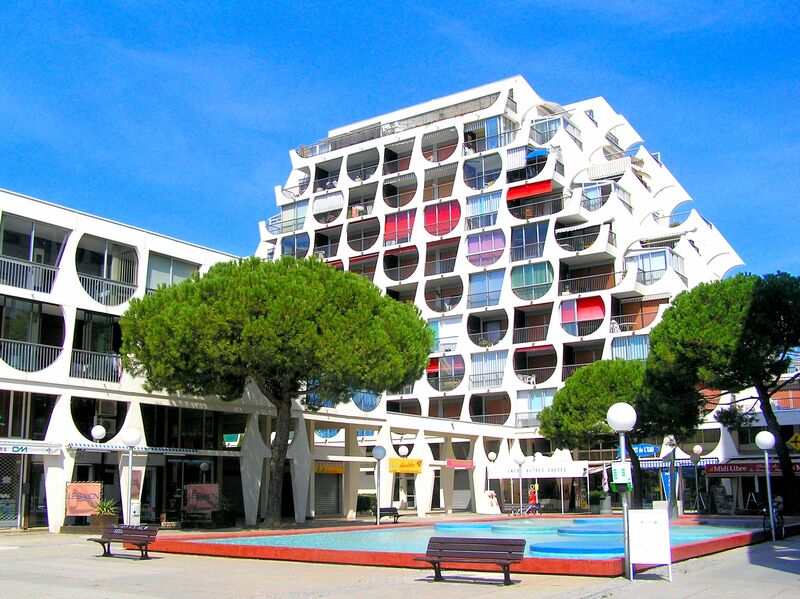 One minute later, the next building displays stunning architecture at 320 Quai Georges Pompidou, 34280 La Grande-Motte, France. 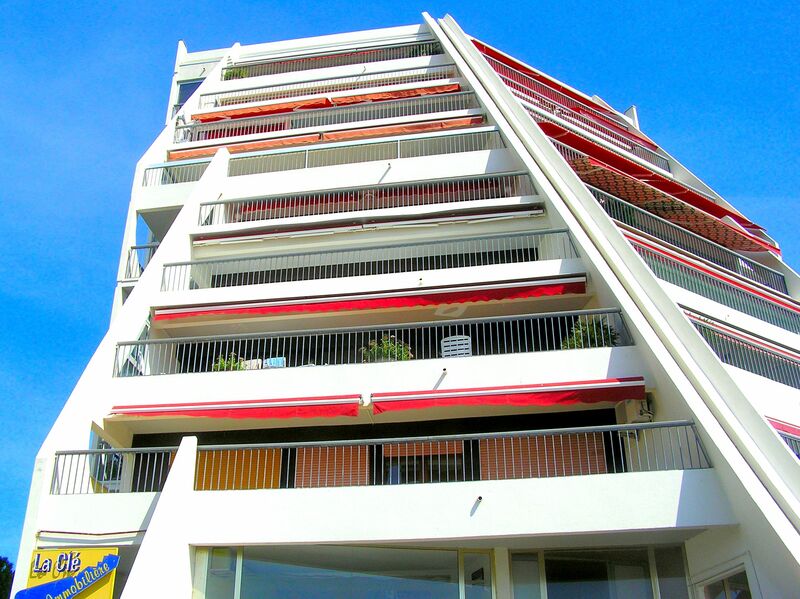 Another minute later, a different view of the same building at 320 Quai Georges Pompidou, 34280 La Grande-Motte, France. Some twelve minutes later, I took this photograph from the Marina Esplanade Maurice Justin, 34280, La Grande Motte which has either 1,452 or 1,538 moorings depending on which official website one reads. The development includes the Palais de Congrès (conference centre) and the church of St. Augustine and is a favourite resort in France with over two million visitors a year. The Lion’s Bar, Lungomare Guglielmo Marconi 31, Lido di Venezia 30126 Venezia. 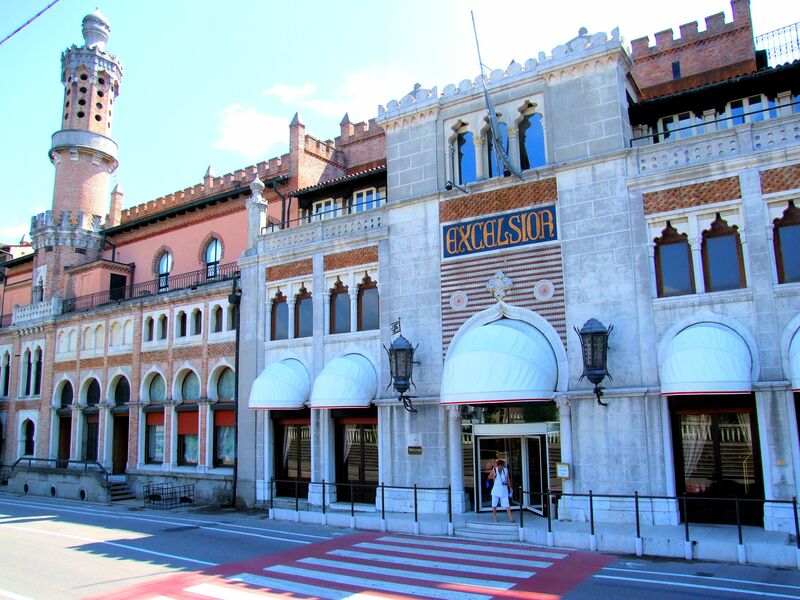 The Excelsior Hotel, Lungomare Guglielmo Marconi 41, Lido di Venezia 30126. 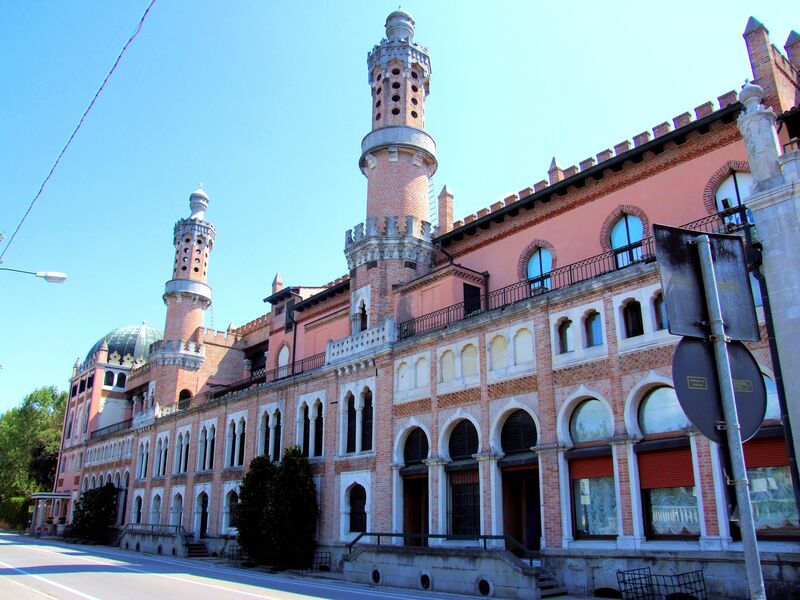 This Moorish style hotel was built in 1908. 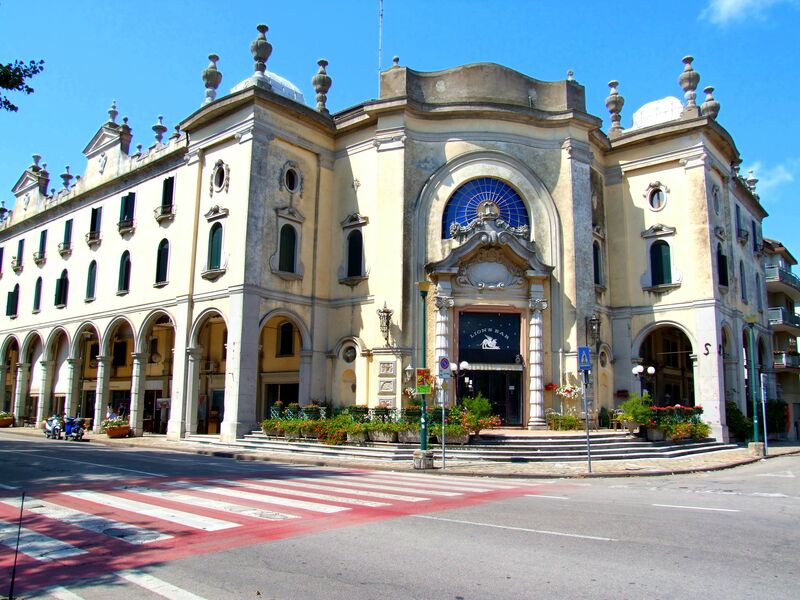 The entrance to the Excelsior Hotel, Lungomare Guglielmo Marconi 41, Lido di Venezia 30126. 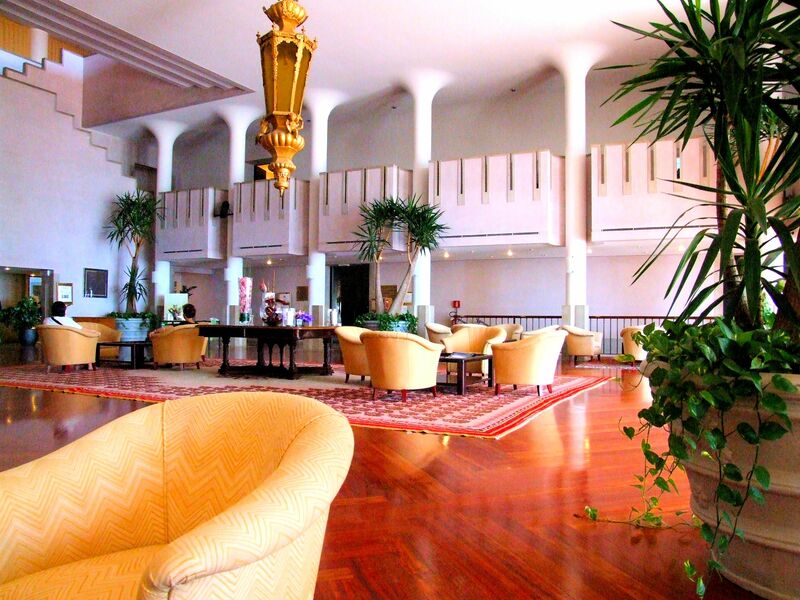 I walked in and sat down in the architecturally fascinating lounge of the Excelsior Hotel, Lungomare Guglielmo Marconi 41, Lido di Venezia 30126. I took a walk around the grounds and the garden of the Excelsior Hotel, Lungomare Guglielmo Marconi 41, Lido di Venezia 30126 to see the architectural design of the back of the building. 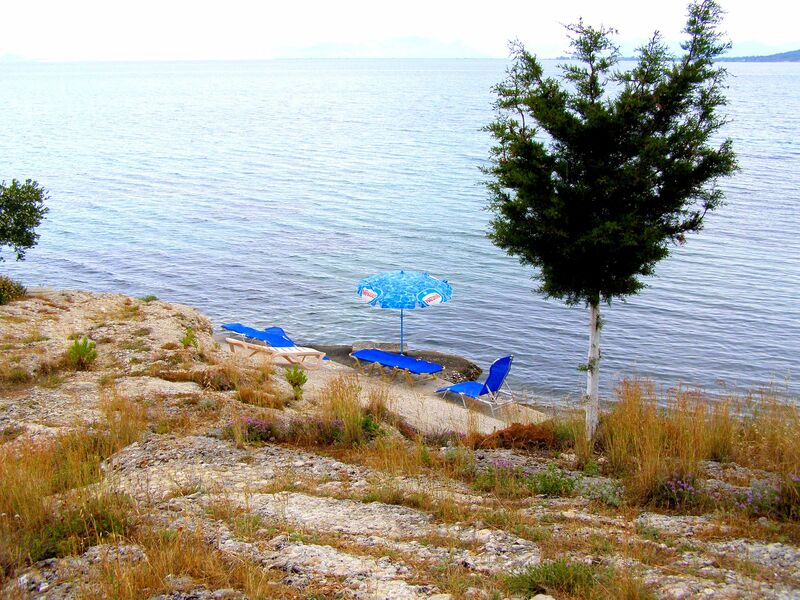 The garden steps lead straight onto the beach. How much did you say chair hire is?!! 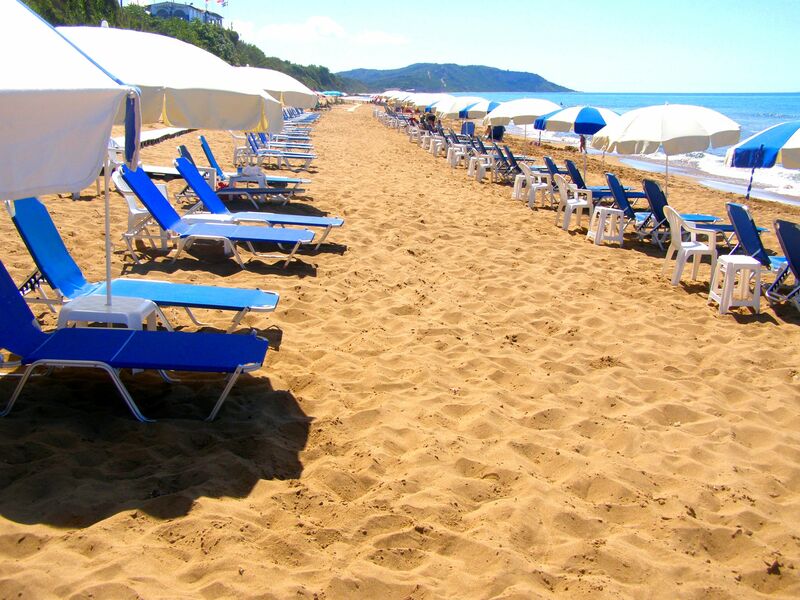 The golden beach at Saint George South (Ágios Geórgios), Corfu. … but this is just scary. A walk along the coast between Petriti beach and Messonghi, Corfu. By Chartres Cathedral, 16 Cloître Notre Dame, 28000 Chartres, France. “We’re so grateful that you came so far just for us. We’ve got your room ready. 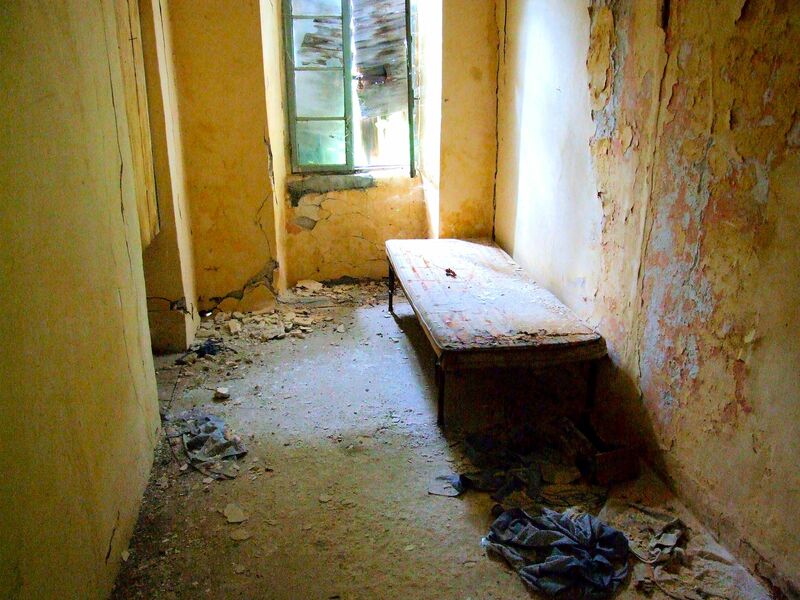 Please have a good rest and if you need anything just ring room service.” A bedroom in the abandoned 13th century mansion just 100m from Petriti beach, Corfu, once owned by Lady Palatianou-Adams, wife of the British High Commissioner and Governor of Corfu, Lord Frederick Adams.